Victoria developed the ability to "shape-change" at an early age. At first, she could only transform herself for short periods of time and could only change her appearance to mimic people that were the same size as she was. As she reached adolescence, she could become anyone she wanted and played mischievous pranks on people. She managed to keep her secret ability from everyone, including her father. Her father was a nobleman who saw that she was unlike other little girls, in that she was interested in science and fencing. He eventually taught her how to use a sword and often told to her, "You are faster than I am, if you had only longer arms, you could beat anyone". She ended up working as a duelist for hire. When her patrons were fearful of their opposition, she was paid to fight in their place. It was a well paying occupation for a 14 year old. Luckily, none of her clients ever saw what she really looked like. On her days off, she daydreamed about the coelacanth, a prehistoric fish whose fossil had been recently found. Almost a century later, a live specimen would be caught off the coast of South Africa. The gallery will be in contact about shipping costs after purchase has been placed. For shipping quotes or international purchases, please contact us. 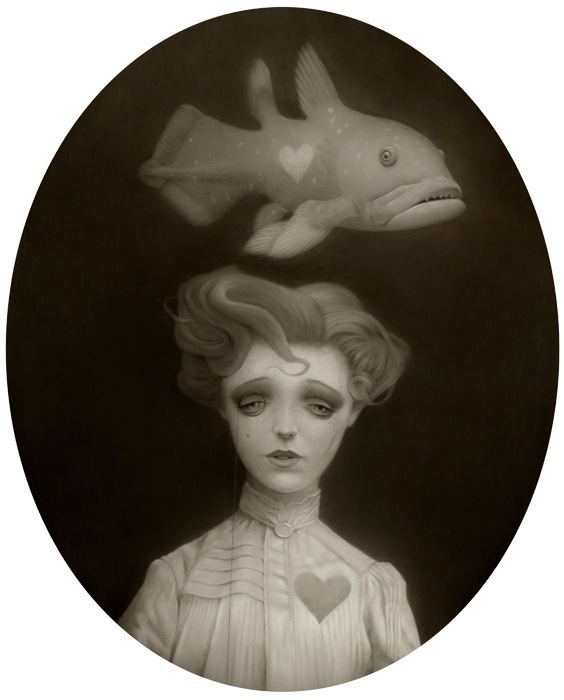 Please note that The Duelist and Coelacanth is only available framed. All limited editions sales are final.